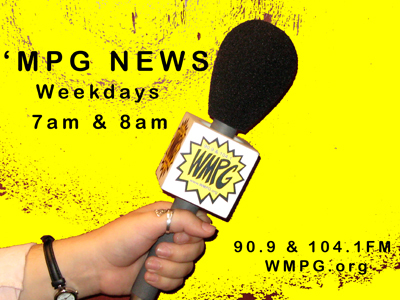 In October, WMPG began airing daily morning news Monday through Friday. Volunteer news anchors now present news breaks at 7 and 8am each day within existing morning music programs. State and local headlines are written and read by the volunteer anchors, and original reports created by WMPG volunteer reporters. The morning news initiative follows a successful year-long beta-test period duruing which the station aired a half-hour weekly news roundup program hosted by volunteer News Director Sam Bullock. In the spirit of community collaboration, WMPG seeks to partner with as many existing local news organizations as possible. The station has also created a new separate training track to empower citizen journalists.